Demand for workers slipped 2.9% in October from a record high of nearly 6.2 million job openings in September. At the same time, the number of hires rose 3.8% to 5.5 million, according to the Bureau of Labor Statistics. The number of hires has fallen short of openings each month since the beginning of 2016, a sign of a mismatch between employer requirements and worker experience. 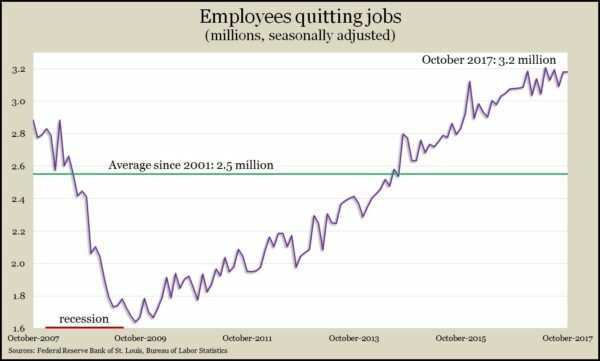 Another indicator of the tight labor market is historically elevated levels of workers quitting their jobs, presumably confident of better opportunities. The Bureau of Labor Statistics said wholesale inflation rose to a six-year high in November, fueled by a 4.6% jump in energy prices. The Producer Price Index rose 3.1% from November 2017, but the less-volatile core, which excludes costs for food, energy and trade services, climbed to 2.4% year-to-year, the third consecutive monthly increase and the highest rate since 2014. The broadest measure of inflation stayed below the Fed’s 2% target in November. The Consumer Price Index also showed a rise in energy prices, including a 7.3% increase in gasoline. The Bureau of Labor Statistics said overall inflation was up 2.2% over the previous 12 months, but the core measure rose 1.7% year-to-year. That was down from 1.8% in October but even with the level of every other month since May. The core CPI last met the Fed’s target in March. The moving four-week average for initial unemployment claims declined for the second week in a row, reaching the lowest point since a 44-year low in early November. Labor Department data show the average level of jobless applications 34% below the 50-year average, which it has been under for nearly five years. The indicator suggests continued reluctance by employers to let go of workers in a strong hiring market. November retail sales rose more than analysts expected with only auto dealers declining among 13 categories. With consumer spending accounting for more than two-thirds of economic output, the Commerce Department retail sales report suggests another boost to U.S. economic growth. Gas stations led the gainers, reflecting higher prices at the pump. Online retailers were close behind in growth rate Year-to-year, retail sales rose 5.8%, up from the long-term average of 4.3%. Gas station sales rose 12.2% since November 2016; online sales rose 10.4%. In a sign that companies are continuing to try to keep supplies in closer alignment with demand, business inventories fell 0.1% in October while sales increased 0.6%. As a result, the ratio between inventories and sales fell to its lowest point since early 2015, back to about where it was just after the recession. Commerce Department data showed year-to-year growth of 3.5% for inventories and 6.5% for sales. The Federal Reserve reported that industrial production rose in November, boosted by the rebound in energy industry following the Gulf Coast hurricanes. Overall output rose for the third month in a row, including production of business equipment, suggesting companies are investing in productivity improvements. Capacity utilization rose to 77.1%, its highest level since mid-2015. Manufacturing capacity reached its highest point since the financial crisis in 2008. Still, overall capacity remained below the 45-year average rate of 79.9%, suggesting a lack of inflationary pressure.